At Embrace Martial Arts, we're offering the best striking skills around with our high-energy Mauy Thai Classes in Wake Forest. This dynamic self-defense skill is perfect for the real-world or competition setting and is an integral component of mixed martial arts. We are proud to train men and women of all backgrounds and abilities. Just fill out the short form on your screen to get started today! There's simply no better way to learn the pure art of striking. Our Muay Thai Classes help you master the strategies of close-range self-defense and maintain control over an opponent with dynamic strikes using your knees, elbows, fists, and feet. 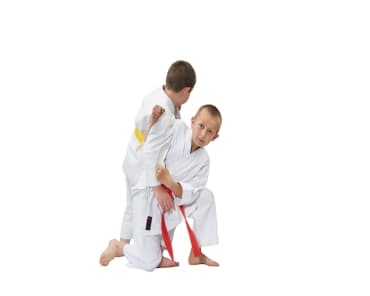 PLUS, you can quickly learn effective clinch work to help you walk away from any situation unharmed. Along with Professor Israel Gomes, our very own Joel Garcia actually contributed to the design of the American Killer Bees Muay Thai curriculum. At Embrace Martial Arts, our instructors work hard to challenge you every day and keep you motivated with new goals and improved efficiency in every movement. Our goal, first and foremost, is to equip you with the best Muay Thai self-defense skills possible. But we're also here to keep your heart racing and your muscles moving on the path to improved health and wellness. Muay Thai training is all about maintaining speed, strength, and balance form any position. With our high-energy workouts, you can accomplish those skills and so much more. We're helping men and women across Wake Forest stay motivated week in and week out and walk away feeling fitter and stronger than ever before. Take The First Step Today! Our Muay Thai Classes Have Something For Everyone In Wake Forest! Don't miss out on the best Muay Thai training in Wake Forest. Our team at Embrace Martial Arts is committed to helping everyone thrive and we're ready to show you why firsthand. Just fill out the short form on your screen to learn more or to get started today! Best thing anyone can do for themselves, caring instructor, high-level martial arts & self-improvement, highly recommend!! Professor Joel is awesome. His Jiu Jitsu is very technical and he teaches at all levels. From the most basic beginner to the most advanced Jiu-Jitsu practitioner. If you are thinking about training Jiu-Jitsu for the first time or looking to move to this Academy, you won’t be disappointed. The only thing that outshines Professor Joel’s skills as an Instructor is who he is as a person. He is an amazing guy that wants nothing but the best for his students. If you are looking for an Academy that has amazing BJJ and Muay Thai, look no further. I know as soon as you meet him you will know exactly what I am talking about. Enjoy. Embrace.